The Crawford Fund’s Tasmania State Committee is proud to have sponsored three scholars to attend the 2017 annual conference on ‘Transforming Lives and Livelihoods: The Digital Revolution in Agriculture’. The Tasmanian Institute of Agriculture, University of Tasmania also sponsored a scholar to attend this year’s event. This year, I was sufficiently fortunate to be chosen as a researcher for the Crawford Annual Conference 2017: “Transforming Lives and Livelihoods: The Digital Revolution in Agriculture” on 7-8 August 2017, Canberra-Australia to join researchers from all over Australia for a prologue to worldwide agricultural research in Australia and to figure out how, as understudies, we can make a commitment in the advancement of nourishment and food security around the world. The key message of the conference was achieving food and nutrition security by unlocking the potential of digital agriculture through innovative technologies and big-data for small and medium farmers. First thing, I was very impressed by the story shared by Dr Lindiwe Sibanda Majele about her “Grandmother’s Farm-Nourishing Africa and the World”. As it described the struggle of small farmers and her commitment towards nutrition and food security for millions of small farmers and their families including women and youth of least developed and developing nations of the world to achieve the sustainable agriculture. It also compelled me to design my future agricultural research to achieve nutrition and food security through sustainable agriculture. Further to it, economics is also very important to utilise resources efficiently to achieve sustainable agriculture as stated by the Honourable Barnaby Joyce MP (Deputy Prime Minister-Australia), “There is great attachment between economics & agriculture”. Both of these speeches strengthen my research paradigm (Social-Economic-Environmental-Policy) to address the issues impeding the small and medium compatible agro-businesses in the world. 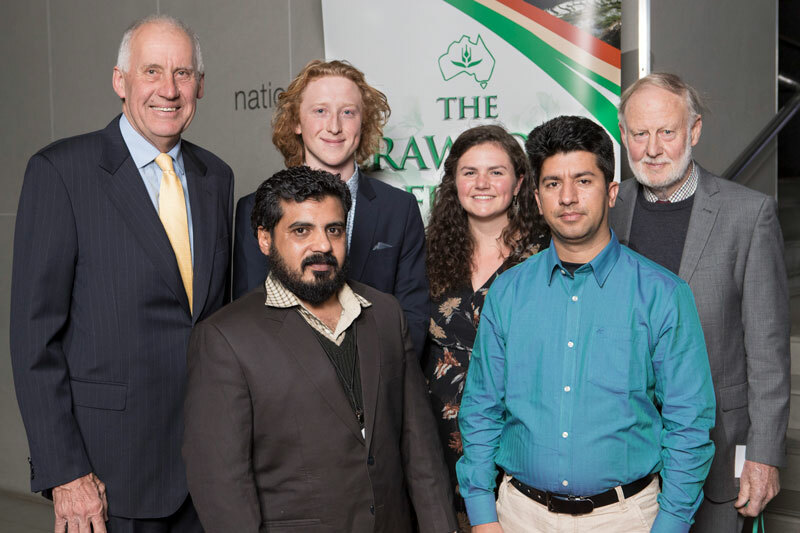 The Crawford Annual Conference 2017 provided young scholars with a fantastic opportunity to learn about some current efforts by Australian scientists working in developing countries and to utilise “Big Data” approaches to improve the sustainable agriculture through digital agriculture, and democratize the benefits for the 570 million small farmers around the globe as they are producing 70 per cent of the world’s food. I benefited from many speakers but mainly Dr Steve Mathews, who presented “Big Data / Modern Analytic Techniques” followed by case study “Global Data, Farm Size, Nutrition and Food Security” by Dr Mario Herrero. Another presentation equipped the young agricultural scholars about issues hindering the digitalisation of agricultural systems and overcoming barriers to digitalise agricultural systems in the developing countries by Dr Andy Jarvis. My mentor and state coordinator connected me with different researchers working in agribusiness and they gave magnificent counsel about building up a system to accomplish my future professional objectives and were likewise glad to remain in contact and give future guidance. In any case, the feature for me was organising with alternate researchers and guides. These networking dialogues were phenomenal since they not just enabled me to advance my own particular research yet additionally encouraged inside and out exchange about conceivable subsequent stages for my venture, and enabling me to add to other specialists’ thoughts. Huge numbers of these talks have proceeded after the meeting and I expect will encourage facilitate coordinated effort to enhance the manageability of agrarian frameworks. In the end, I want to thank the Crawford Fund and Cathy Reade for giving me the chance to go to this extraordinary gathering. It was extremely instructive and I would rush to prescribe this occasion to any other individual that is energetic about horticulture for improvement. The revolution that is ‘digital technology’ formed the title for this years Crawford Fund’s conference ‘Transforming Lives and Livelihoods: The Digital Revolution in Agriculture’. I was fortunate enough to attend the 2017 Crawford Fund’s annual conference, where the pressing issues surrounding global food security, an ever growing world population and the unprecedented opportunity ‘Big Data’ provides for alleviating poverty and hunger were presented and discussed by world leading keynote speakers. As an undergraduate studying my second year of a Bachelor of Agricultural Science at UTAS, the conference opened my eyes to the importance and range of opportunities there are for graduates in being able to make a contribution towards achieving global food security. Dr Lindiwe Majele Sibanda gave The Sir John Crawford memorial address titled ‘A New Narrative for Ending Hunger’. Dr Sibanda gave a heartfelt and inspirational speech on the importance of food security, and the need for an integrated global approach using nutrition as a driving force to ending hunger. Dr André Laperrière addressed the importance of data being knowledge and empowerment to allow smallholder farmers to make better and more informed decisions. These are just two of the numerous speakers who addressed and raised important topics surrounding international agriculture. To have the opportunity to not only listen to such acclaimed and experienced speakers but be able to ask questions during question and answer times as well as networking sessions provided an incredible opportunity. It has been an absolute privilege to have had the opportunity to attend the Crawford Conference and scholar days, an experience I can not speak highly enough of. To learn about the projects building capacity in developing countries and the impacts they have to improving the lives of others is inspiring. A common theme across all the projects was the importance of social relationships to ensure the greatest success and outcomes for the projects. To meet such an enlightened group of people who have been apart of and lead so many projects in developing countries highlighted the importance of international agriculture to building capacity and improve international food security, and the opportunity there is for agricultural graduates to improve the livelihoods of others. The range of expert and passionate keynote speakers, opportunities to meet other like-minded students and graduates, and exposure to incredible sources of inspiration are just a few reasons why anyone interested in agriculture should attend the conference. From frontier technology to the importance of cultural social relationships, the conference covers a range of topics that will certainly capture the attention of anyone involved or seeking to be apart of agriculture and its importance internationally. The journey ahead for global agriculture to ensure every human has access to nutritious and appropriate levels of food is enormous. There is no easy solution and it will take the collaboration of data, resources and scientific knowledge to increase food production to meet the growing demand. After hearing from the speakers and delegates at the Crawford Fund Conference and the enthusiasm of the scholars who are passionate about international agriculture, it made me excited about the path ahead and to walk that journey with like-minded peers. This year I was fortunate to receive a scholarship from the Crawford Fund to attend the Crawford Fund conference 2017 Transforming Lives and Livelihoods: The Digital Revolution in Agriculture, held in Canberra. The Conference was both informative and challenging. We heard from some incredible speakers, with the conference opening on Monday night with an address from Dr. Lindiwe Sibanda. This address highlighted the importance of crop diversity in small scale mixed farms, as a diversity of crops provide a range of essential nutrients. Research presented by Mario Herrero displayed that as farm size increased the nutritional diversity of the food produced decreased. Both speakers highlighted the importance having a strong focus on nutrition as the problem of global food insecurity is addressed. The topic of nutrition became one of central themes of the conference. The role of big data in agricultural systems was presented in several contexts. Andre Laperriere highlighted how big data can be made accessible and applicable to the “the little guy”. That a mobile phone can be the tool which connects the small holder farmer to open source big data sets. For this data to be fully utilised it needs to be findable, accessible and solve a problem. Steve Mathews displayed how this can be made possible, arguing that data needs to be cleaned, sorted, free and presented in an understandable fashion. He also highlighted the work that needs to be undertaken to better integrate technology into all agricultural systems. He provided data which showed the agricultural sector to have the lowest adoption of digitalisation of 23 sectors. Dr. Ken Street gave an example of how big data can be used to inform breeding programs for crops with increased resilience to environmental and biological pressures. This has been achieved using a system termed FIGS, which layers multiple data sets to identify environments where suitable germplasm may be located. This case study highlighted how big data can be applied in a simple way to achieve outcomes with large impacts. Each of the scholars was paired with a mentor for the duration of the conference. The mentors challenged our views of the topics discussed, and were invaluable during the networking events. It was an amazing opportunity for the students to meet, and learn from, men and women who have been so influential in the area of agricultural development. The scholar days, hosted by RAID were highly beneficial, and provided scholars the chance to discuss in-depth topics highlighted during the conference. It was exciting to hear about the many opportunities young people have to get involved with research for development. It was also encouraging to hear about the large positive impacts, seemingly small projects are having in communities around the world. The conference was a fantastic couple of days I would recommend it to anyone with an interest in combating the issue of global food insecurity. I would start sharing my experience and exposure as a scholar participant in Crawford Conference with cordial thanks and a salute to the great Sir John Crawford. I don’t know much about him but as much I know is enough to say that if we need a world with sustainable agriculture and long-term development we have to extend his vision and approach. I came to Australia with a hope and determination that during my two years candidature I shall absorb all the knowledge and skills which I can and will deliver them back home. My vision is to transfer the latest technological and scientific knowledge that can benefit Pakistan’s Agriculture system. I would like to thank the Tasmanian Institute of Agriculture, School of Land and Food for sponsoring my dream. Secondly, the mentors were the bridge between the participants. It was really amazing to hear and see some of the concepts which I only had read about in articles. The speakers, professionals and scientists delivered very easy to understand and clear view about their expertise. Among all sessions and presentations, I would like to mention few that matched my interests and future plans. As I worked on a large group of genotypes in my Masters, the uses and challenges of big data for agricultural development helped me to understand the logical and practical handling of big data, Moreover, it also provided some ideas that how can I best present my research work. I picked that ICT application can uplift the rural agriculture systems. This will deliver systematic services and can help to improve nutrition and agriculture production in areas where farmers are less educated and deprived. The use of software and new automatic farm machineries have always fascinated everybody. But along with this, its utility and effectiveness has also been admired by stakeholders at every level. The advancements have enabled the farmers to manage the crops with just a push of button. Now the physical effort is reduced and accuracy is increased, and production has also increased by timely management of farm practices. The sessions on digitalising agricultural systems in the developing world by Andy Jarvis held my attention and boosted my knowledge. Besides this, the introduction and detailed session about Mobile Acquired Data (MAD) also enabled me to generate an idea about how these could fit into the agriculture systems in Pakistan. It was wonderful to meet and listen to people who were working in ACIAR and RAID, travelling extensively, and achieving their goals. Many of them have worked in Pakistan and it was amazing to see them highlighting the issues in Pakistan’s agricultural sectors. The support of Australian Awards in motivating young scientists and professional is encouraging and I shall be looking forward to getting benefit from this networking experience.